The holiday destination of Park City is famous for its three world-class ski resorts: Park City Mountain Resort, Deer Valley, and The Canyons. Together they form one of the USA's largest ski areas. The Canyons resort features eight mountains, 146 trails, and 3,500 acres of diverse terrain, suited to every style and ability. Deer Valley Resort contains thrilling chutes and bowls, and caters for everyone, from families to individual ski and boarding champs. Lessons and child care are available. From deep powder bowls to long groomed runs, gentle beginner slopes to steep chutes, four world-class terrain parks and the 2002 Olympic Superpipe, Park City Mountain Resort has something for everyone. Park City was a former silver mining town in the 19th century. Its Main Street is a restored historic district that adds a different dimension to the character of the town, which is now home to stylish condos and the state's most sophisticated resort community. Main Street is lined with quaint shops and galleries that make for very satisfying browsing. The town has a wide variety of shopping opportunities, everything from handmade furniture, books, and art collectibles to brand-name bargains in a factory outlet mall. Sportswear, particularly ski-gear, abounds. Each of the three holiday resorts in the town also have their own shops for visitors. 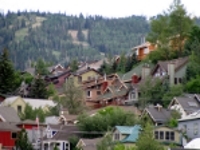 Park City contains a plethora of restaurants, at least 100 of them, catering everything from fast food to haute cuisine, budget to bank-breaking, steak to sushi. Despite Utah's rather stringent liquor laws, there is no problem having a well-oiled night out in Park City, with more than 20 nightclubs and bars. Most operate as private clubs and visitors may purchase temporary membership for a nominal fee. Apres-ski is just as lively a party here as anywhere else in the world.